"How Long is This Hall!? 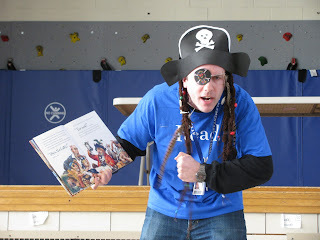 ": A Pirate Took Over our Preschool! Our preschool was so excited today to welcome a very special visitor from a...a...a PIRATE SHIP!? Let's just say, our principal has no problem dressing up and telling a story in a great pirate voice! The preschool children LOVED it! This was SUCH a fun way to celebrate Read Across America! 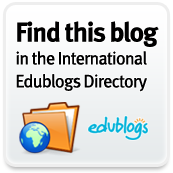 Our principal had a great name for the pirate: Bulldog Beard (since our school mascot is a bulldog). 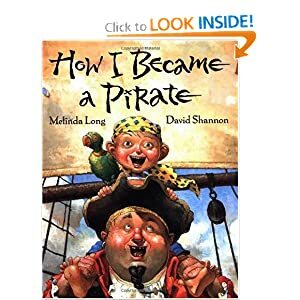 The pirate then read the book: How I Became a Pirate by Melinda Long and David Shannon. When it came time to take a class picture with the pirate we gathered around and wiggled and took a picture! When I looked at it later, I realized that another little guy had his nose about two inches from our principal's face just looking at him...trying to figure out exactly WHO this pirate really was! What a fun way to celebrate Read Across America!